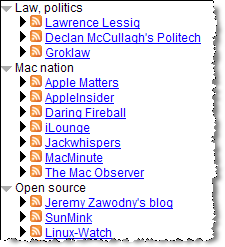 When I add a blog to NetNewsWire, it will end up on the blogroll. I'd really like to organize the blogs/feeds by my seven categories, but I don't know how to do that in Newsgator yet. When/if I figure that out, you'll see the categories appear on my blogroll. Here are two possible solutions. The first approach would generate a Flash Javscript based blogroll navigator while the second approach provides an HTML based blogroll list arranged in categories which can be embedded on your website using the iframe tag. Method 1: Grazr - Accepts URL of a blog feed or an OPML file. Feeds may be in RSS, RDF, or Atom formats. With Grazr, you have to specify the OPML file url and the dimensions [width, height] of the grazr window that would be placed in your blog layout. Here's a real example with CNet Top 100 Blogs. Method 2: Optimal browser - Specify the OPML feed address and Optimal browser generates a very neat HTML based blogroll arranged in categories. You can use the Optimal Brower Widget to generate code for inserting the blogroll as an IFRAME in your blog. Click for a real example. Both Grazr and Optimal Browser provide a small code snippet to insert in your blog template. While both the services are fast and quick to install, it really depends on what kind of experience you would like to provide to your site visitors and whether you would like to help your blogroll partners with some Google Juice.